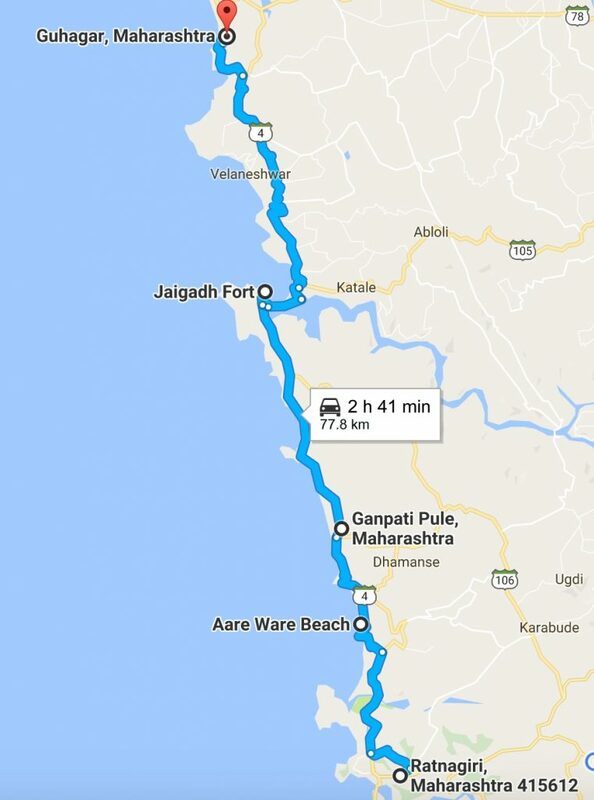 Konkan Trip: The Coastal Ride - Freeway! 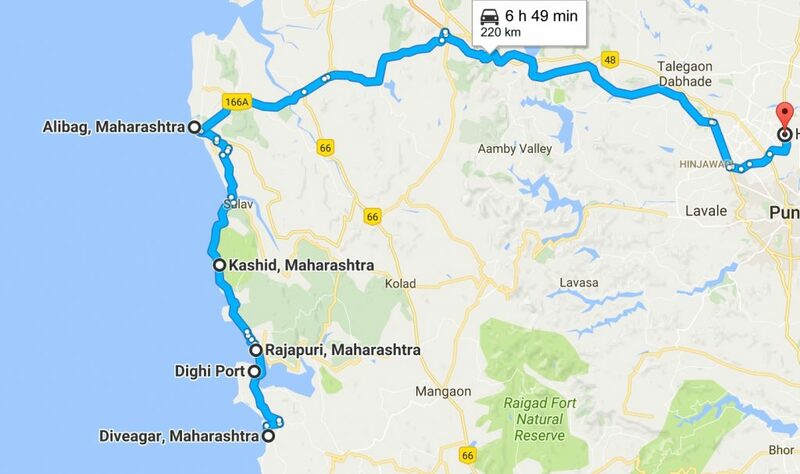 On the auspicious morning of 68th Republic Day, on 26th January 2017, me and my friends, went for one of the most awaited road trip of my life, the ride on the coastal roads of northern Konkan. For me, this tour was all about — simple bikes and crazy friends, sleepy nights and energised days, exploring beautiful aquamarine sea and moon white sand beaches, naughty waves sparkling in silver sunshine and soothing your soul by tickling your feet, golden sunrises and orange sunsets, thinking about dreams and thinking about life on a seashore, talking with friends and forgetting all bad things, switching off mobiles and watching the thousand stars in the sky lying on a beach, hot striking winds and cool humid sea breeze, potholed roads and silky smooth mountain passes, kneeling on crazy curves and revs on straight highways, wide open dry wastelands and ever green mangroves-coconut trees, dark black and shiny red soil, testing and extending limits, cement jungle with people and actual jungle with real monkeys, our present and our proud history, creating moments and writing unlimited memories. This is just a simple travelogue, about the routes, roads, stops, stays, food and of course the ride. I wish I had a GoPro to record everything. Well, this was my first long ride. (I am a novice when it comes to long distance riding.) Since I started riding, I always wanted to do a ride along the never ending blue waters of sea. 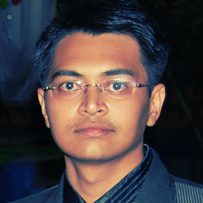 Some three months back, I felt like, this is the right time to go for it. So I started researching for the best possible route. I was actually planning this for the year end, but due to lack of availability of time for few friends, we had to postpone it by a month. In the initial plan, Goa was on the itinerary, obviously. 😀 But you know, only couple of days would have been like injustice to legendary Goa. 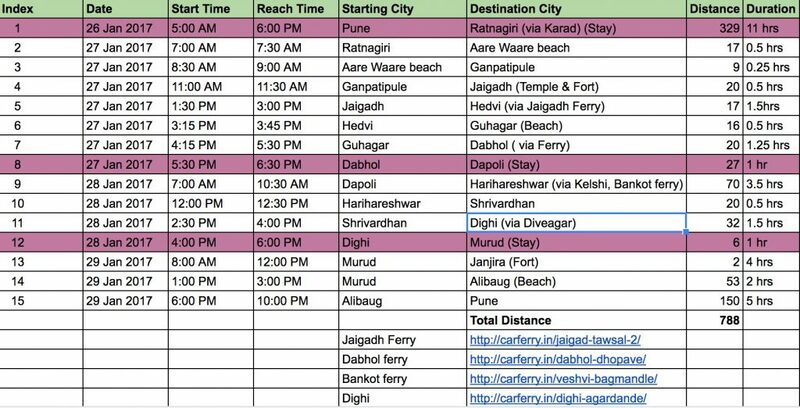 So, I had to drop Goa from the list and now whole four days were wide open for exploring the ever green Konkan. I went back to Google Maps, started looking for more detailed route, which passes through small villages and from where we will be able to see the sea as we ride. After some rigorous research, meticulous planning ( 😆 ) of the waypoints and some conference calls, the excel sheet was ready in Google Docs. (Because, for software professionals like us, sprint planning is really necessary before starting any project, otherwise we don’t feel the pressure of deadline 😀 😆 ) Okay, I noted down all necessary contact numbers, name of places to visit, villages and waypoints, saved the route area as offline in Google Maps, because I did not want to take any chances. Here is the screenshot of plan from the Google Docs. As per plan, ride was stretched across three nights and four days. Total distance covered was 790 kms approximately. I ended up with this plan so that, on the last day we would have to travel minimum distance while coming back home, it felt more logical. Here is the actual route and stays we had after some run time alterations. We were supposed to leave Pune by 5:00 am, but my friend Dinesh couldn’t make it to Pune, a day before due his work, instead he arrived in the morning of 26th Jan. One more friend Hrishikesh, came from Kalyan to Pune on 25th by late night train, I had to sleep so I asked him to grab an Ola. He reached my home at 1:15am on 26th. He’d already dropped his Rosy Pulsar at my home a week earlier. Everything was packed and we were all geared up and ready. Said temporary good-bye to my family, went downstairs and cold started our bikes. Cold starting is necessary to keep the engine in good state, it warms up the machine and gives you good performance, especially on highways and helps in avoiding unnecessary load during start of ride. Skies were clear and flaunting the best hues of blues, sun had started parade on the horizon and it was a beautiful shiny morning. On the auspicious occasion of 68th Republic Day, students were going to school holding small flags, people were in hurry to reach the flag hoisting ceremony. We saw few RE riders twirling the throttle to make Tirangaa wave, overall it was very energetic environment to ride. 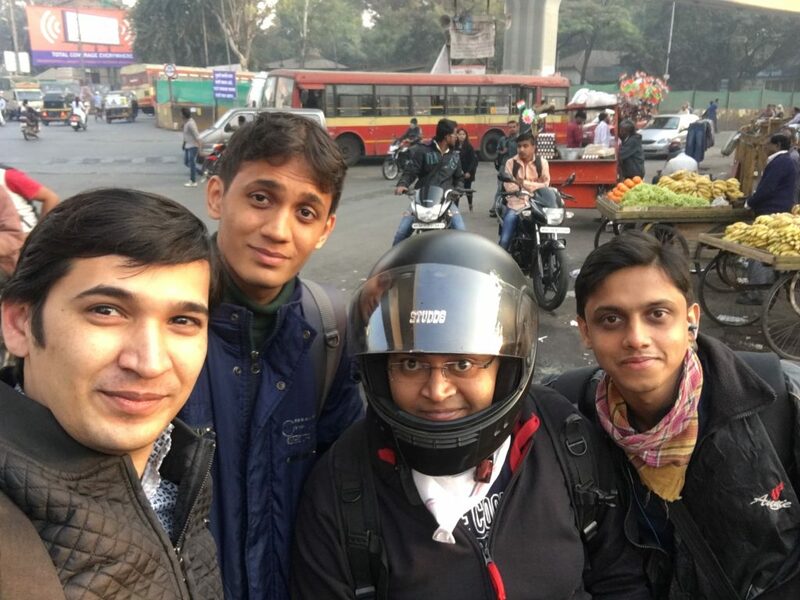 Picked up fourth friend, Raunak, near Swargate and we officially kicked off the journey in full swing at 8.15 am. Riding through the little annoying morning traffic of Satara roadfrom Swargate, we reached Katraj ghat and the road in ghat section was just at very bad condition. Damn, all the big sized gravel was resting there and we went on a NUTTERTOOLS like vibration mode. I am not sure whether the road was under construction or not, but there was no sign of tar or construction equipments. Anyway, we reached my favourite spot on curve in Katraj ghat from where you get to see beautiful view of Pune city, bid a good bye in mind and moved ahead. Before merging on Bengaluru highway, the road goes through the Katraj tunnel. When you enter any tunnel suddenly everything becomes more beautiful, the scrappy truck looks more amazing, all lit in yellowish-orangish lights and road becomes noisy due to sound echoes and if someone shouts aloud then it echoes like hell. After few minutes we were on the Bengaluru highway. From this point onwards, it was just like cruising on wind for next few hundred kilometers. In about an hour, after crossing Kapurhol, we reached our first stop Shirwal. We stopped at Shriram Wada Pav for breakfast and tea/coffee. 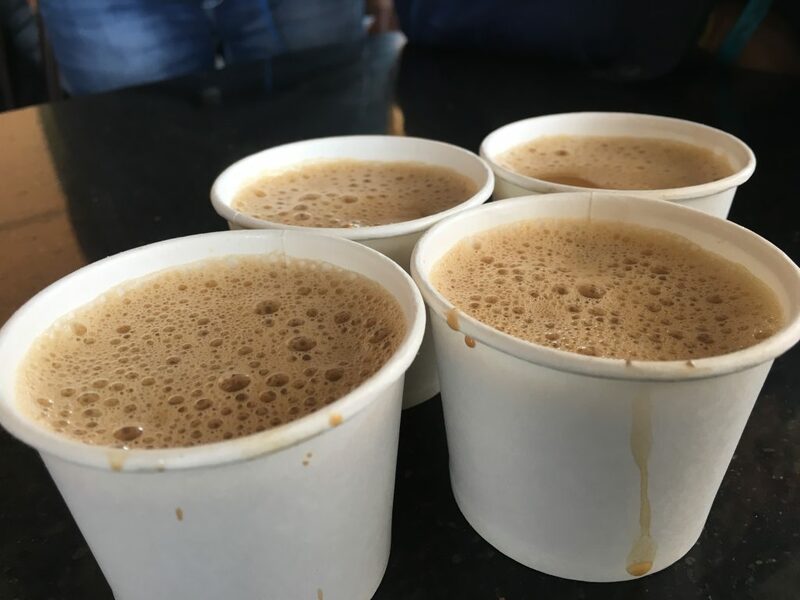 It was a perfect time for breakfast so it was very crowded and every Punekar travelling on Bengaluru highway was halting there. 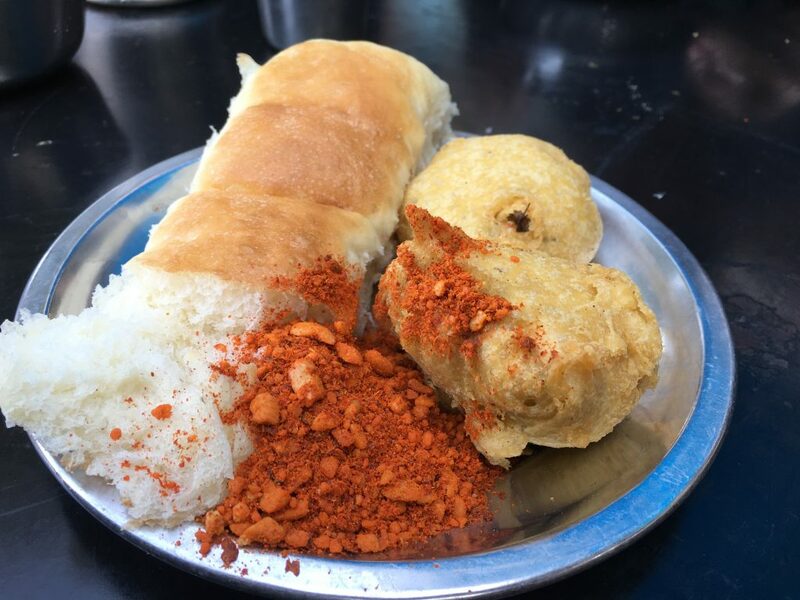 If you haven’t tasted the Wada Pav and Misal here then you should, it is one of the best on the route. They have the token system so it doesn’t take much time to get the food, but you need eagle eyes to grab the table and chairs during peak time. We ordered 4 Misal, 2 Wada pav, others had their teas, I had my coffee, I generally prefer coffee while on road. Our half an hour break turned out to be 50 minutes break. One thing to remember that when you do long ride, you should eat light and drink more to keep your body hydrated enough. The more you eat, the more tired and sleepy you will feel and you will miss the enjoyment of ride. If your are a novice like me, then it would be good to take break after every 70/100 kms, do little stretching, have water/tea/coffee, try to avoid artificial sodas like coke, sprite as they will make you more thirsty, instead go for lemon water. Okay, after snacks, we resumed our journey towards our next stop Satara which was 60 kms ahead. Road was amazing, we were cruising on 85 kmph. After Shirwal you should be more careful about people crossing highway at undesignated places. 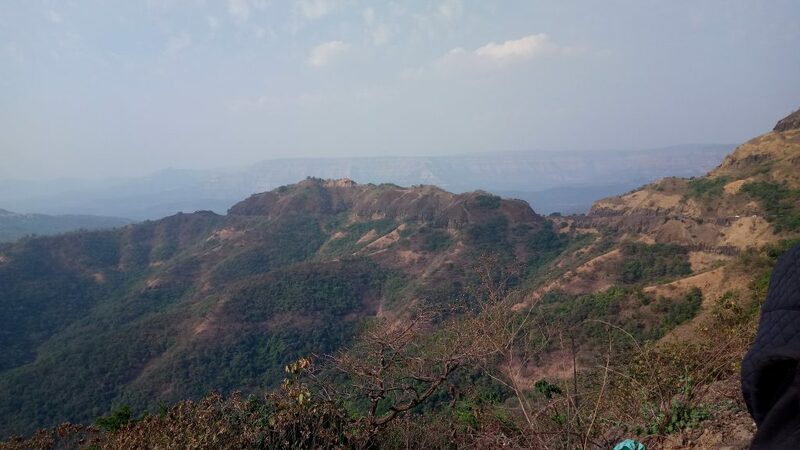 On the way to Satara we reached Khambataki ghat. During monsoon this ghat looks more beautiful at the same time it is little dangerous too due to landslides. It is one way ghat, so you don’t have to worry about vehicles coming from opposite direction, but some people drive like idiots causing traffic jams at turns. Once you cross this ghat, it is like straight road till Satara. 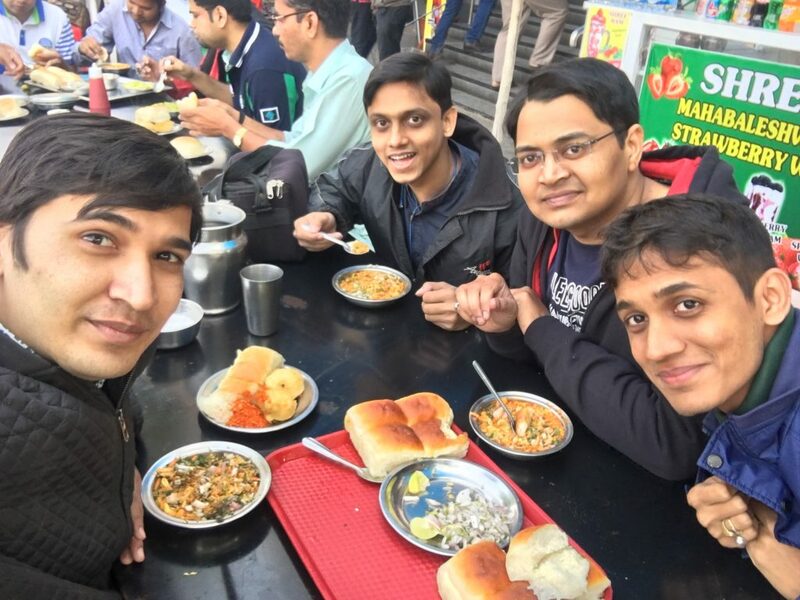 After crossing Satara, we took a break near an Indian Oil petrol pump as my fellows were feeling little hungry 😆 , later we decided just to have teas. After 20 mins break we were back on road. From here Karad was 52 kms. After some 40 mins we reached Karad. From here, we had to take a right according to google maps. We took an exit from Bengaluru highway took a halt and had a fruit plate and lemon water. It was feeling very hot due to the Jacket and gloves, but lemon water did its job, it is like ‘coolant’ to our ‘engine’. 😀 Google map was very confusing, so we asked directions to the lemon water guy, he said go straight for 2 kms and take a similar right below the flyover. We decided to go via service road as from Map, it was not sure if there is an exit or not. We rode for some 1.5 kms and took a right, but it was wrong turn. 😆 We asked a person — a typical old man, he was wearing big lense glasses, had stick in hand and a Shela wrapped around the head — he gave us correct directions. We thanked him and merged on Bengaluru highway again; after 1 km there was an exit and finally we were on the right track. That junction is called as Pachvad Phata. Now, we were on a smaller road, soon the typical village area started. It was the Kale-Pachvad road. 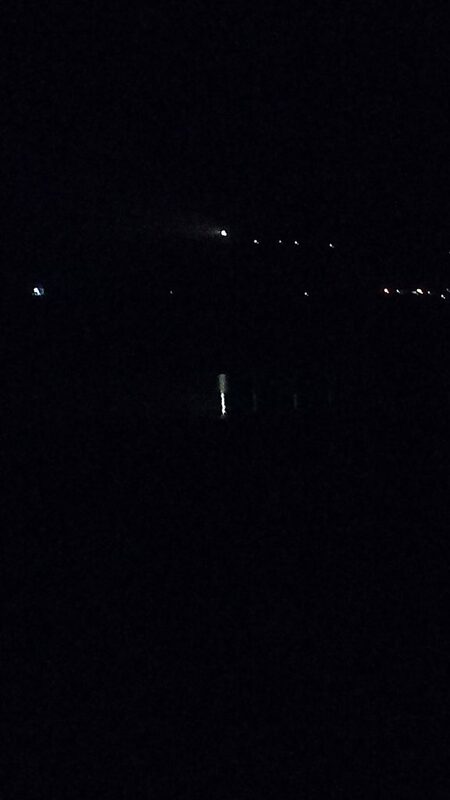 At many many spots, road is so damn spooky that you would never want to travel there in night on a bike. It was all jungle on both sides, except the area near villages. There are many bad patches, at some places there are only potholes, gravel and no road. After riding some 40 kms till Kokrud, there is one ghat section. I am not aware of its name, if you know then please comment down below. The ghat was looking amazing though road condition was still okay-okay. I am sure this ghat would look very beautiful in monsoon. 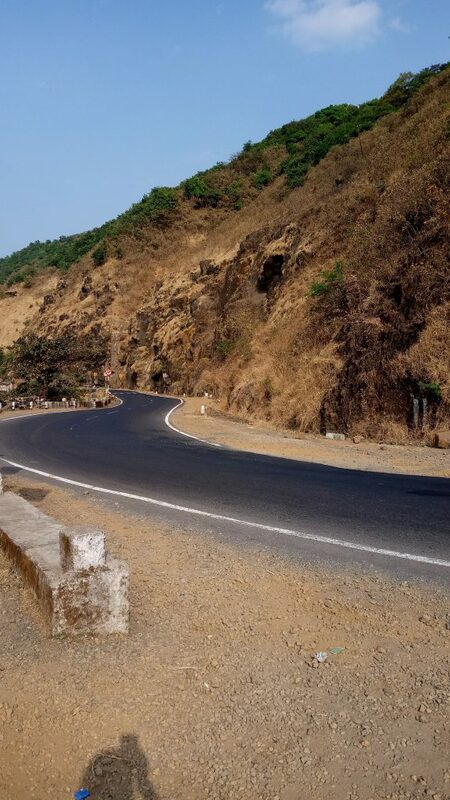 We mistakenly took it for Amba ghat but after checking the Maps we found that it is different. Aamba ghat was still around 40 kms ahead from there. We immediately resumed the ride. We rolled down from Aamba ghat and touched the Konkan. 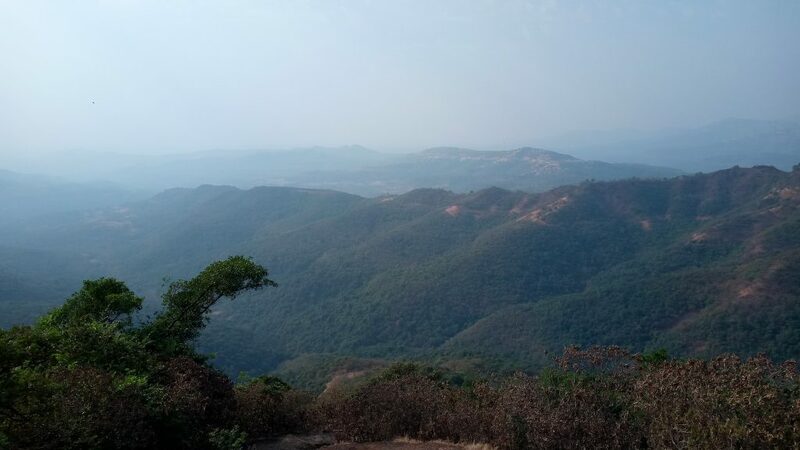 You will feel the change in environment with the red soil, steady winds and heavy wind blast on bike, increased humidity and greenery everywhere. 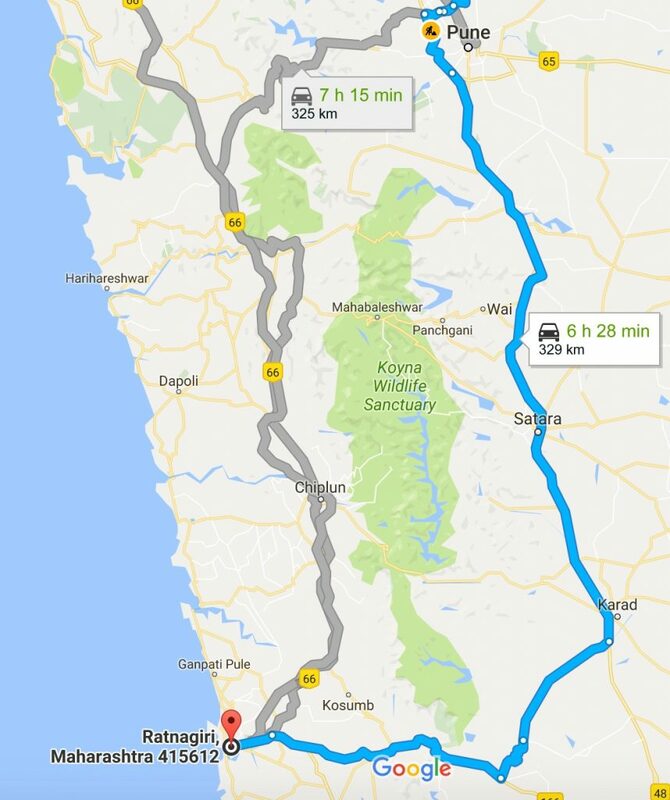 After sometime we joined the Mumbai-Goa highway, you have to go up north from here for around 10-12 kms to reach the junction for Ratnagiri. 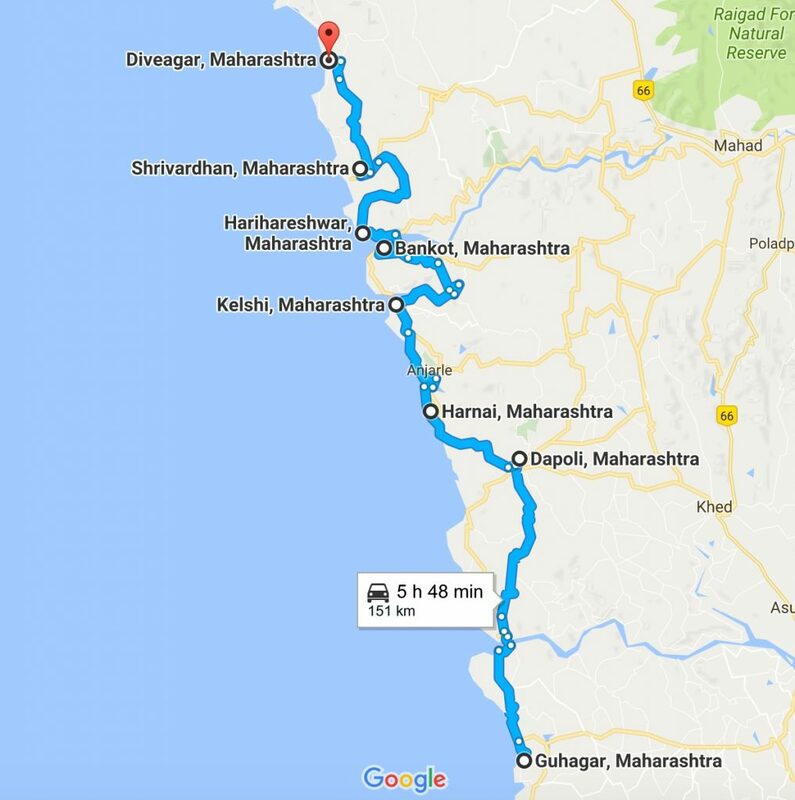 We were really confused by seeing Mahad and Panvel on milestones and no Ratnagiri, so just to double check we asked someone if we are on correct route. Thank god we were on right path and reached junction for Ratnagiri, took left and Ratnagiriwas just 12 kms. As we were closing the humidity was increasing and wind blast was becoming heavy though I was only at around 55 kmph. We entered Ratnagiri city at around 5:45 pm. We stopped to search for hotels on Google Maps. Went to one hotel near Bhatye beach, but it was too costly. Meanwhile we witnessed very nice view of sunset over Bhatye beach and from a bridge over a creek. 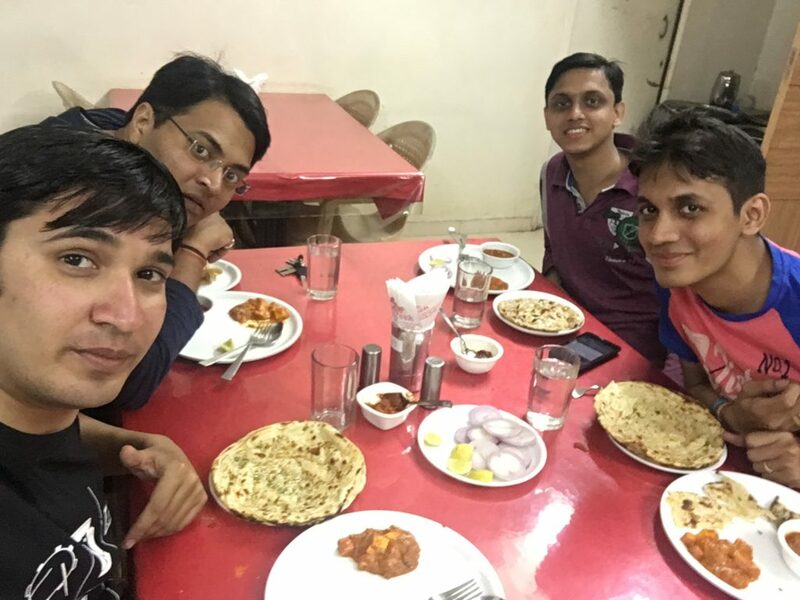 Finally, we found a cheap lodge located at main street near Patwardhan high school. The guy took 700 bucks for 4 of us. They gave extra mattresses, room was okay, had AC but no remote, 😀 he said there will be hot water at specific time but wasn’t available. Don’t recommend this lodge if you are travelling with family. Alright, this was the first day, we came back to room and slept. Stay tuned for Day 2, it was legendary and there are many beautiful pics.